Rig your vang system so it has a good combination of power and adjustability. You need enough purchase to get maximum vang tension in the heaviest winds. However, you don’t want so many parts that you create extra friction when tensioning or releasing the vang. Also, its a good idea to lead the vang so it can be played from both sides of the boat, and make sure you can release the vang quickly when necessary. On one-designs, use a strong piece of shock cord to pull the vang toward the gooseneck when it’s not in use. This will make tacking much easier for forward crew members. On bigger boats, don’t use the vang to push up on the boom (except in unusual conditions) since this can make it hard to get the right amount of leech tension. Before every race, be sure to check your vang system for wear and tear since this is one of the prime spots where you could have a breakdown. The amount of vang tension you use should be roughly proportional to the wind velocity. In light air you may not want any tension on the vang at all; in very strong wind you generally want a lot of vang tension. When you’re sailing upwind, more vang tension will make your mainsail flatter. 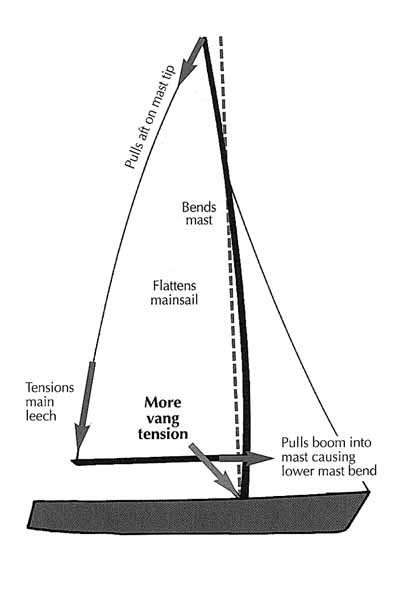 That’s because it creates more bend in the mast and boom (See diagram). Be careful you don’t get caught with too much vang in light air or waves. Many boats use a technique called “vang sheeting” when sailing upwind in a breeze. If you don’t vang sheet, one problem you have is that when you ease your mainsheet in a puff, you allow the leech to twist and you make the mainsail fuller (because less leech tension means less mast bend). This is not good in a puff. You could prevent this by dropping the traveler to leeward instead of easing the mainsheet. However, on many boats the traveler is not easy to play or it doesn’t have enough range. This leads us to the vang. By using a tight vang (i.e. vang sheeting), you control mainsail twist and shape with the vang. The sheet then controls the lateral position of the boom, which is quicker and easier than using the traveler. On a reach or run, a good ballpark setting for the vang is to tension it so the upper batten is parallel to th boom. You may need to adjust the vang fairly often as the wind velocity changes. In light air, you don’t usually need any vang because the weight of the boom by itself makes the leech to tight. However, in wavy conditions, try pulling the slack out of the vang to keep the boom from bouncing too much. On some boats (e.g. Thistle), the shroud position won’t let the boom go out far enough on runs. In these cases, keep the vang eased so the mainsail leech twists off until the upper batten is perpendicular to the wind. This allows you to sail lower with the mainsail working more effectively. On a windy reach, assign on crewmember to play the vang (if possible). This person should keep the vang control line in her hands all the time. She should pull harder on the vang when you can use more power; she should ease the vang when you are getting overpowered and/or when the end of the boom is getting close to the water. On a windy run, a lot of vang tension can help you keep the boat under control. If you allow the mainsail’s upper leech to twist too much it will push the top of your mast sideways, making the boat more unstable. Avoid this by pulling the vang hard enough to reduce twist. Make sure you are ready to release the vang if the end of the boom gets near the water. In light air, a common mistake is sailing with too much vang tension, both upwind and down. So err on the side of having too little vang. In heavy air, when overpowered, more vang is usually helpful, so make sure you have enough. On some boats it’s difficult to adjust the vang while you are racing. On most boats, however, it is relatively easy to adjust vang tension, so use this control to help you shift gears as the conditions change. Pulling harder on the vang has a significant effect on your rig, especially upwind. Besides tightening your leech, it bends the mast and flattens the main.